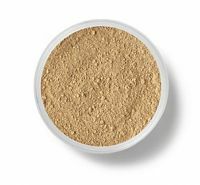 Devotees of this popular loose powder foundation insist it makes fine lines and acne scars disappear, while just as many naysayers complain it highlights flaws. Our verdict: If you love a powdery, matte finish, look no further -- unless you're dry or highly pigmented. Those skin types seem to get less favorable coverage or staying power. But this product is talc-free and contains honest-to-goodness minerals, making it of better quality than its equally priced, less authentic "mineral" competitors. I'm a fan of the fact that this foundation is all-natural and good for skin. I also love the fact that I can combine hues for the perfect shade for my complexion. But, overall, my experience was not at all what I had hoped for. Coverage was uneven--no matter how carefully or well I worked with the Kabuki brush--and the powder adhered to miniscule creases, accentuating them. The finish was not ...read moreunusual. It left a sheen, but it appeared unnatural. 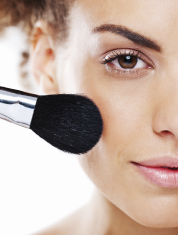 I can accurately tell a woman wearing Bare Minerals by the same "glow," and I don't like it. This product has very light coverage. I don't see how they can call it a foundation. It deposits into lines and wrinkles and still shows flaws. It is very messy since it is a loose powder. Does not go on smoothly when you start with a primer. Do not recommend. What in the world is in this stuff? I was a loyal Bare Minerals users for YEARS. I've never had good skin, so I liked the coverage that I would achieve with it, and the brushes that came with the kit. UNTIL one day, when I accidentally spilled this on my bathroom counter. I tried to clean it up with a dry towel, but it just smeared. I tried and tried to clean it up, finally resorting to a steel wool pad and Clorox bleach to scrub it...read more off. It took me an hour. I know that they bill this stuff as all natural, but if I can't clean it off of my non-porous countertop with chemicals and hard scrubbing, then what in the world is it doing to my face? I will never ever use this again.